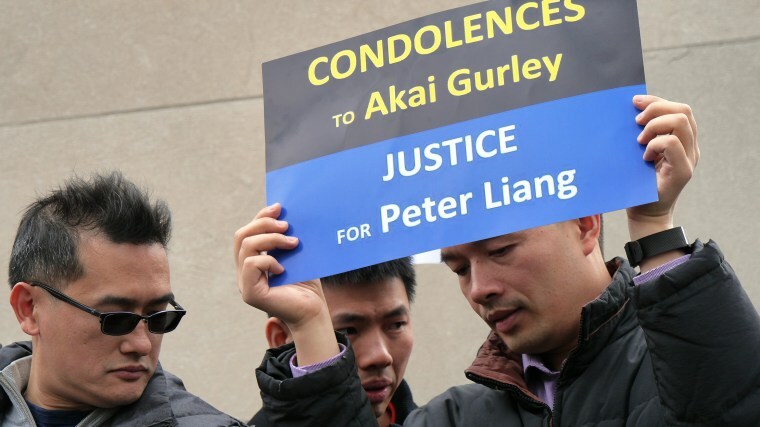 Days after former New York Police Department (NYPD) Officer Peter Liang fatally shot Akai Gurley, an unarmed black man, in a Brooklyn housing project in November 2014, Cathy Dang headed to East New York to meet with people organizing on behalf of Gurley’s family. Dang said her group, CAAAV Organizing Asian Communities, founded in 1986 to address police and hate violence toward Asian immigrants, has rallied in the past behind civilians injured in police incidents, sometimes fatally, and this case was no different but for one detail — the officer involved was Chinese American. 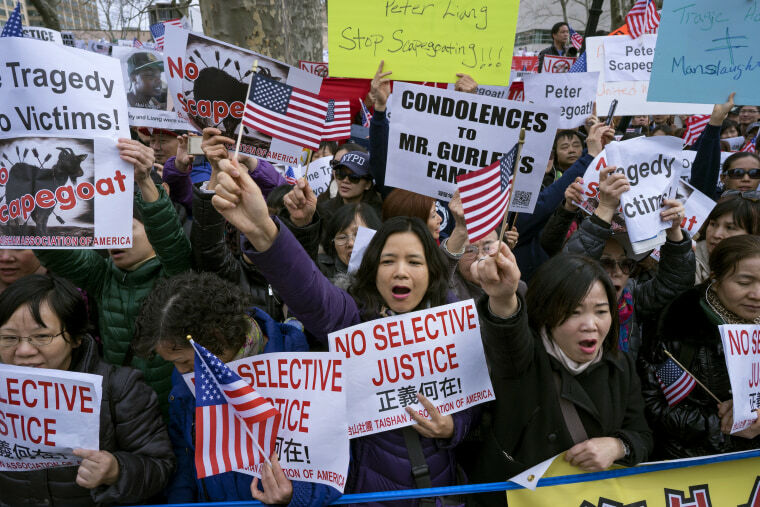 For Phil Gim, who helped organize the Feb. 20 Brooklyn rally in support of Liang, which attracted thousands of demonstrators, most of them Chinese, the shooting was a tragedy for both Gurley and Liang. But like many who attended nationwide demonstrations in over 30 cities that day, Gim also believes that 28-year-old Liang was sacrificed to compensate for white officers who weren’t indicted in fatal incidents involving unarmed black men, including Eric Garner in Staten Island and Michael Brown in Ferguson, Missouri. While counterexamples exist on both sides, Liang’s Feb. 11 guilty verdict for second-degree manslaughter and official misconduct has exposed a schism in the way Chinese Americans have rationalized the former rookie officer’s prosecution and conviction. That divide, some in the Chinese-American community say, is the result of generational differences between older immigrants, for whom Chinese is a first language, and their children who grew up in the United States. Shortly after Gurley’s death on Nov. 20, 2014, Chinese and Asian Americans found themselves unwittingly thrust into a national debate on policing, which up until then had centered largely on white officers and black civilians. That night, Liang and his partner, Shaun Landau, both of whom have been dismissed from the NYPD, were performing a vertical patrol of an unlit stairwell at the Louis H. Pink Houses when Liang’s gun, which was drawn, went off. The bullet, fired from the eighth floor, ricocheted off a cement wall, striking Gurley who had entered the stairwell with his friend Melissa Butler from the seventh floor. Prosecutors portrayed Liang’s actions that night as reckless, saying he fired without reason, then argued with his partner over calling for help as Gurley lay dying while Butler performed CPR. Liang’s attorneys have said he was in a “state of shock” when his gun accidentally went off, that he was unaware his bullet had struck anyone, and that he tried to make several radio transmissions that were incomplete or didn’t go through. Then about a month later, another Chinese-American NYPD officer made headlinesacross the country, but for a very different reason. While sitting in a marked patrol car in Brooklyn on Dec. 20, 2014, Wenjian Liu and his partner, Officer Rafael Ramos, were shot to death by Ismaaiyl Brinsley,a 28-year-old with a history of arrests who made threats against police on social media after shooting his girlfriend in Baltimore. Brinsley committed suicide on a subway platform later that day, killing himself with the same gun he had used on Liu and Ramos. With both incidents reported on extensively in Chinese-language media, an immigrant group traditionally wary of police now felt a direct connection between its community and the NYPD, a department in which roughly 6 percent of its 34,000 officers are Asian. 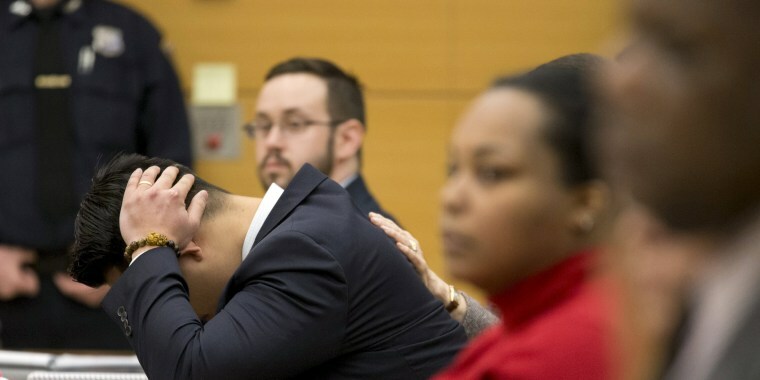 For many, that connection grew stronger when Liang, who was born in New York and grew up in Chinatown, was indicted for manslaughter and other charges by a Brooklyn grand jury last February. Lee, 64, helped put together one of the first rallies for Liang last year on March 8 at City Hall, which he said attracted several thousand participants. One week later, Dang, 31, held a vigil for Gurley outside Police Headquarters in Lower Manhattan, attended by CAAAV members and Gurley’s family. “I know it gets painted like a picture that he’s used as a scapegoat, but ultimately Peter Liang did take a life, and he did do something wrong,” Dang said. She added that CAAAV, whose 350 active members include many high schoolers who are Asian and South Asian, also took part in demonstrations in December 2014 after a Staten Island grand jury did not indict Daniel Pantaleo, a white NYPD officer accused of applying a fatal chokehold on Garner. 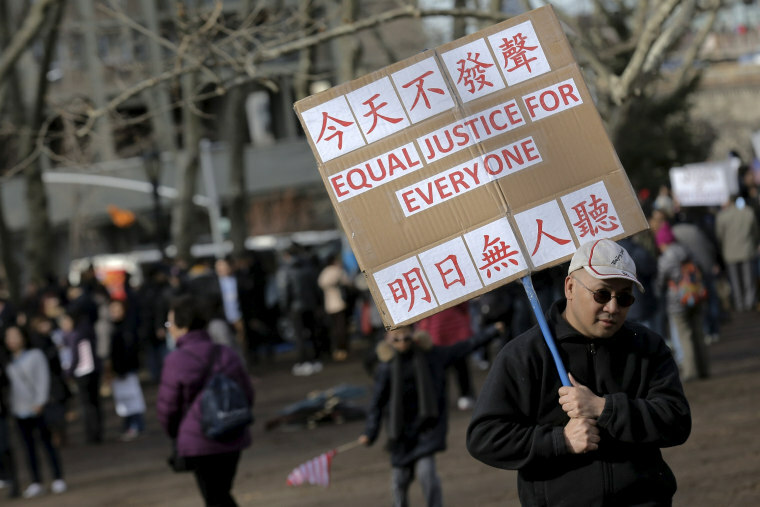 As protests on both sides began to take shape, it became clear that Liang’s core base of support derived largely from older Chinese-American immigrants, many of whom speak Chinese as a first language. “Chinese immigrants from China are the ones mainly out there because the organizers are mainly that,” said Gim, who left Hong Kong for the U.S. in 1962 when he was 10. Lee, who emigrated from Hong Kong in 1970, put it another way. But Dang, a Chinese Vietnamese born in the U.S. who grew up in New York and Los Angeles, said she was saddened by the message of the Feb. 20 rally in Brooklyn, organized by the Coalition of Asian Americans for Civil Rights. For Liang’s supporters, the medium through which the message is largely communicated is one that enjoys wide popularity among many in the Chinese-speaking community — WeChat. Released in 2011 by Tencent, a Chinese company, WeChat is a mobile voice and text messaging service that also allows users to participate in chat rooms. One of the most popular is “CivilRights平台－纽约－挺梁,” now closed to new users because it has reached its limit for those who can join. Wei said many participants in the Feb. 20 Liang rallies were Chinese immigrants who came to the U.S. during the last 20 years, many of them having limited contact with people who speak English. They are also the ones most likely to use WeChat, he said, adding that Chinese-language discussions on the platform have become increasingly polarized. Following Liang’s conviction more than two weeks ago, the groundswell of interest in the case has also rippled out across the country, coursing through many Chinese-American communities. Alex Tom, executive director of the Chinese Progressive Association in San Francisco, a group that organizes low-wage workers, told NBC News that CPA San Francisco has spent much time clearing up what he said was misleading information on WeChat, a platform many of his members use. “We want to be a space where people know they can ask questions, understand various positions, and also know that we’re coming from a place of a broader mission and values,” said Tom, 40, whose organization is one of dozens of Asian-American groups supporting CAAAV, which, according to Dang, was threatened and harassed on social media after Liang was convicted. Tom, whose father is from China and mother is from Taiwan, added that these days, all his members want to talk about is the Liang case, even when organizers want to discuss wage theft, one of CPA San Francisco’s core issues.